The Wichita Broadside Project sponsored by HarvesterArts, River City Poetry, and the Wichita Arts Council, was the brainchild of April Pameticky. Final results were held as the opening event of Poetry Rendezvoux 2017. 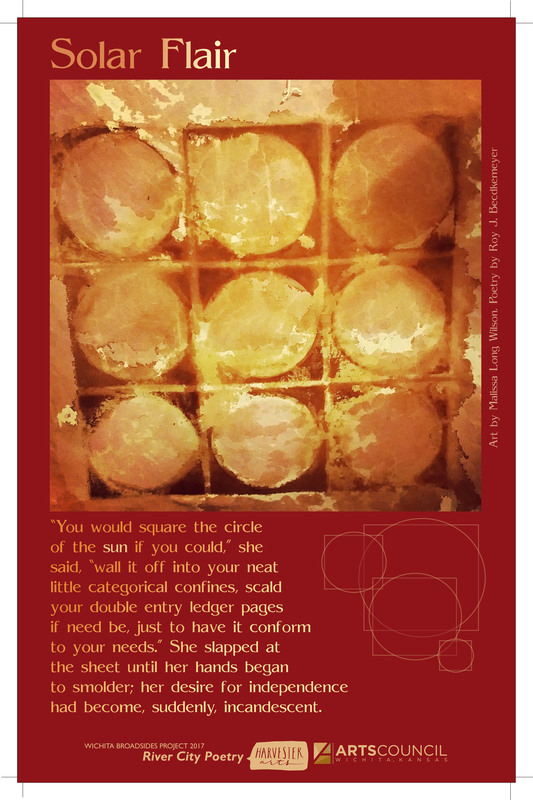 This collaborative effort, in which I wrote a poem inspired by Malissa Long Wilson’s great piece of art, is titled “Solar Flair,” and it was one of the broadsides chosen for distribution. We hope you enjoy this. Broadside art and text copyright by Malissa Long Wilson and Roy J. Beckemeyer. Original 12 by 18 inches with 11 by 17-inch crop lines.